3. And keep me company for fifteen minutes while meditating on the Mysteries of the Rosary, with the intention of making reparation to me. 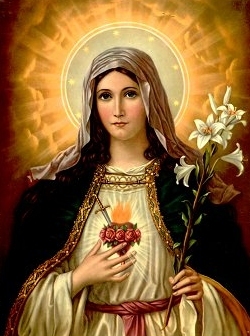 When we observe the Five First Saturdays, we are to console her Immaculate Heart, and to make reparation for all the blaspehemies and ingratitude of men. O Most holy Virgin and our Mother, we listen with grief to the complaints of your Immaculate Heart surrounded with the thorns placed therein at every moment by the blasphemies and ingratitude of ungrateful humanity. We are moved by the ardent desire of loving you as our Mother and of promoting a true devotion to your Immaculate Heart. We therefore kneel before you to manifest the sorrow we feel by the grievances that people cause you, and to atone by our prayers and sacrifices for the offenses with which they return your love. Obtain for them and for us the pardon of so many sins. Hasten the conversion of sinners that they may love Jesus and cease to offend the Lord, already so much offended. Turn your eyes of mercy toward us, that we may love God wilh all our heart on earth and enjoy him forever in heaven.